Important ownership and copyright information. 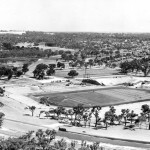 All photos designated ‘Library Board of WA’ are reproduced by permission Battye Library and are copyright Library Board of Western Australia. All photos designated ‘Town of Cambridge’ are reproduced by permission Town of Cambridge. In all cases the original copyright holders are unknown. All photos designated ‘Watson’ are copyright J. A. L. Watson. The photograph of the painting by W. F. Ramage is reproduced with the permission of the Royal Western Australian Historical Society Inc. There is no restriction on the use of the photo as long as The Society is acknowledged. 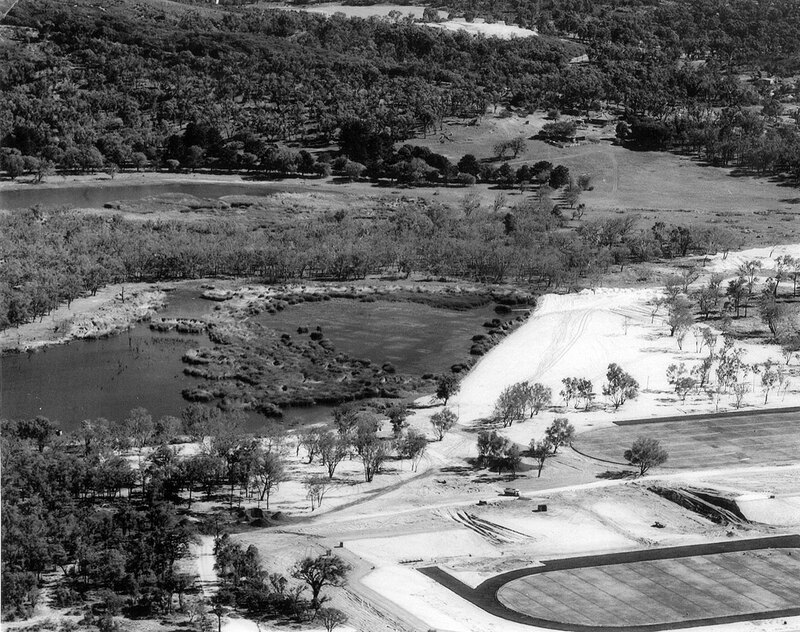 Oblique aerial shot taken circa 1959 as part of the planning for the Perry Lakes stadium complex. 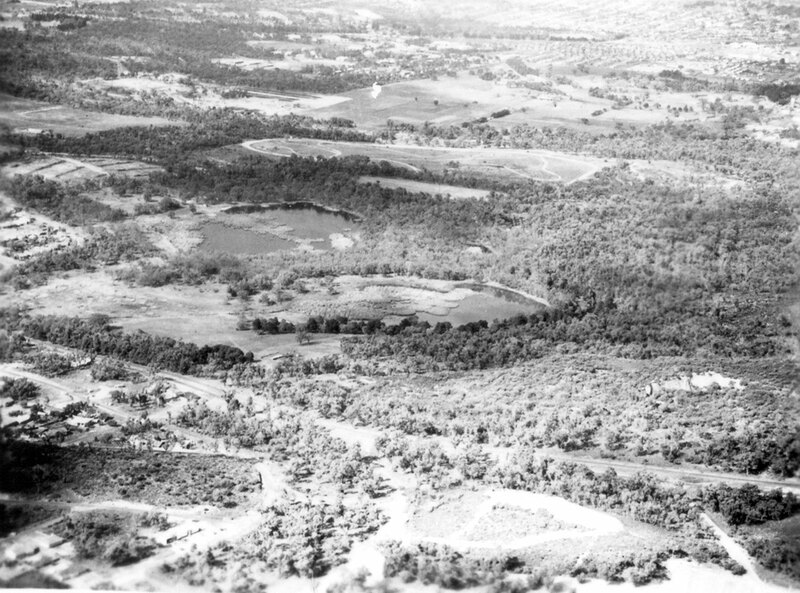 Shot taken looking SE with East Lake (in distance) and West Lake (in foreground). 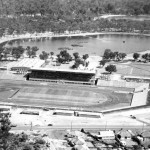 Oblique aerial shot taken circa 1959 as part of the planning for the Perry Lakes stadium complex. 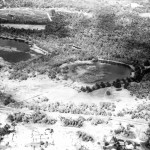 Shot taken looking south, East Lake (to left) and West Lake (to right). 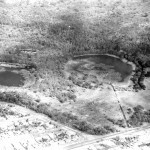 South Lake (now filled in) is visible between and beyond the two larger lakes. Dead trees are clearly visible in East Lake. 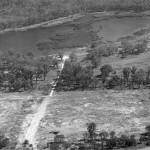 The Plank Road (now Oceanic Drive) in foreground. An open storm drain is visible crossing the Alderbury Flats. 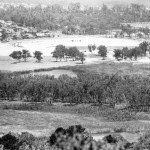 A cropped portion of this photo appears in Chapter 2 as Plate 2.4a. 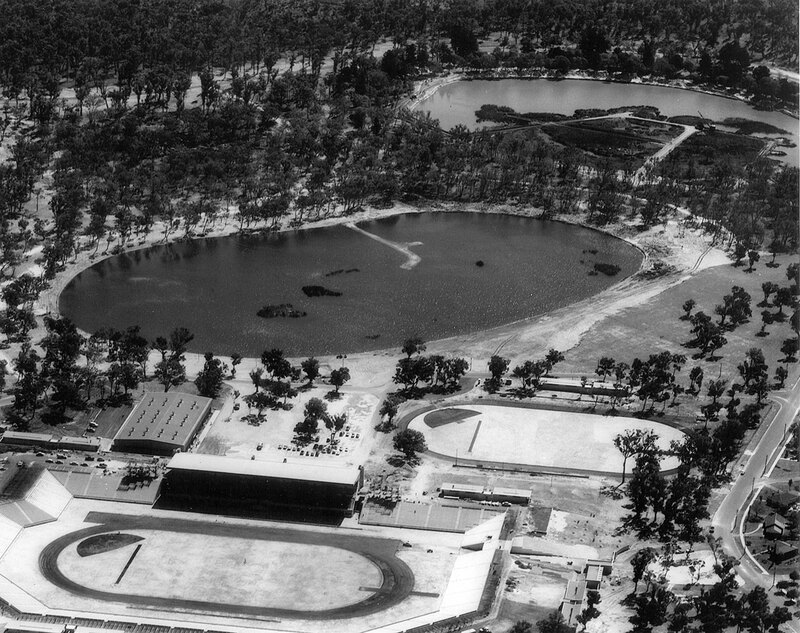 Oblique aerial shot taken circa 1959 as part of the planning for the Perry Lakes stadium complex. 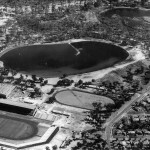 Shot taken looking SW. East Lake is partially truncated. This is possibly the best photo of the original wetland vegetation in West Lake. 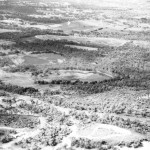 A cropped section of this photo appears in Chapter 2 as Plate 2.4b. 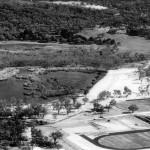 View across West Lake (foreground) to East Lake circa 1961. 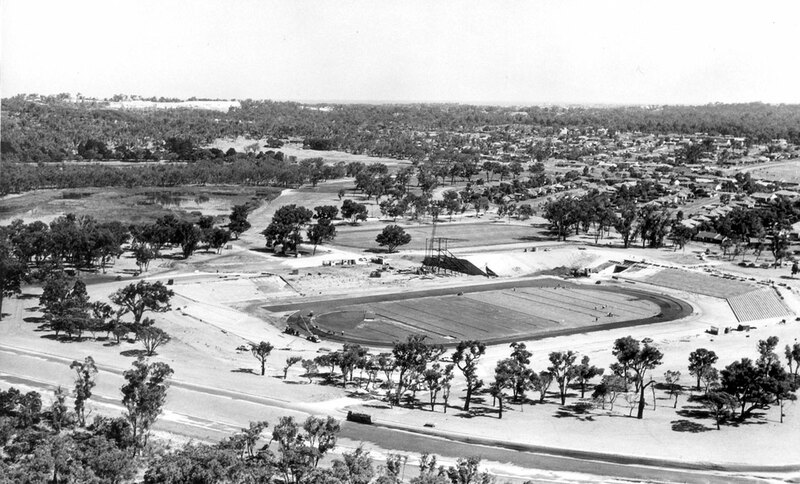 Site works for the Perry Lakes stadium in background. 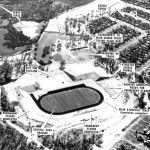 Aerial view looking NW across stadium site to East Lake circa 1961. 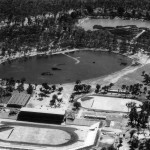 Aerial view looking NNW East Lake on the left and stadium site to the right circa 1961. 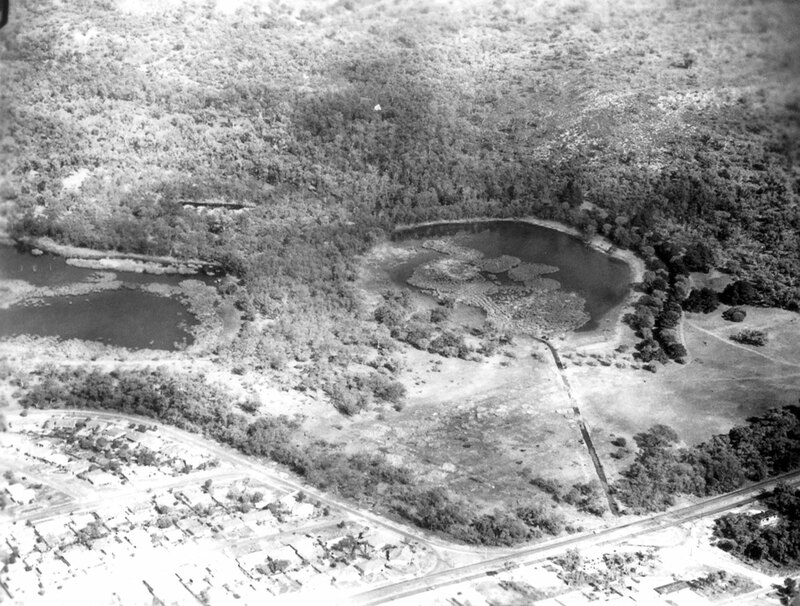 Promotional aerial photo view looking NW circa 1961. 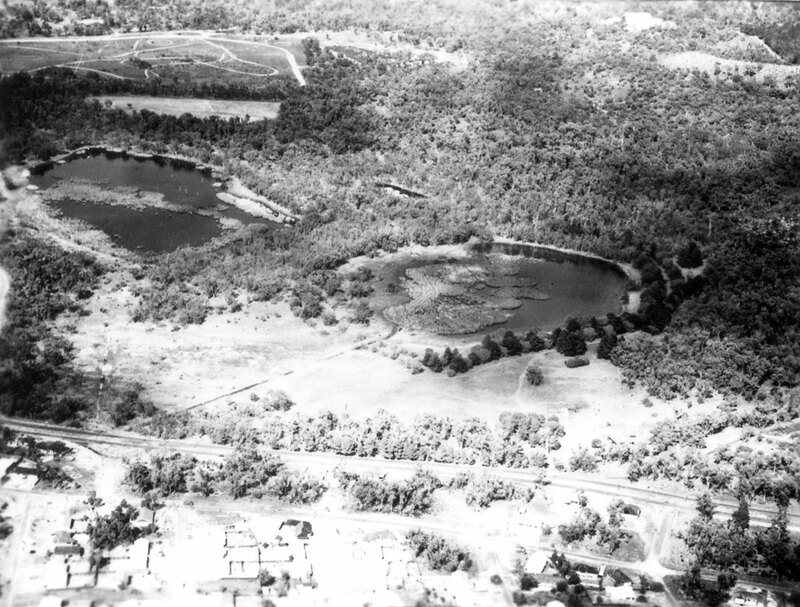 East Lake, with original wetland vegetation is visible upper left. 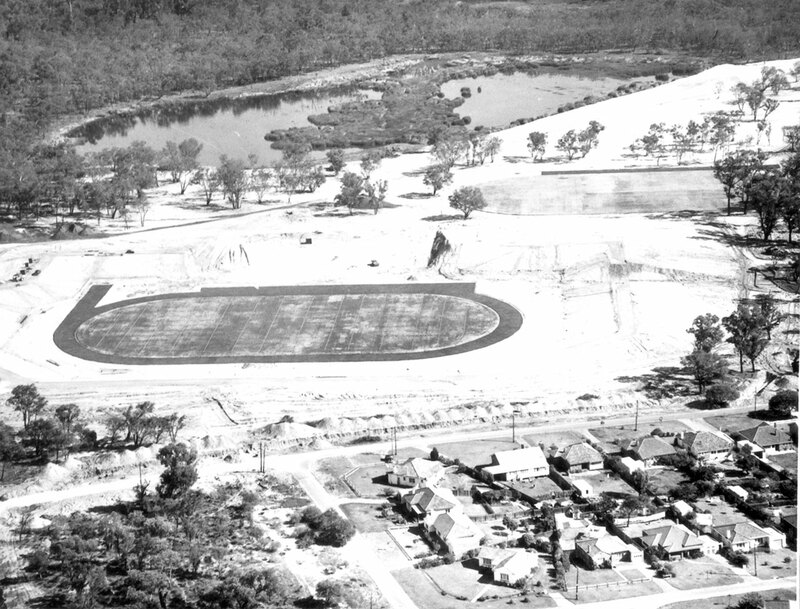 View looking west 1962 across completed stadium. East Lake (mid ground) has been dredged and banks reformed. There are a few remnant patches of Baumea articulata. 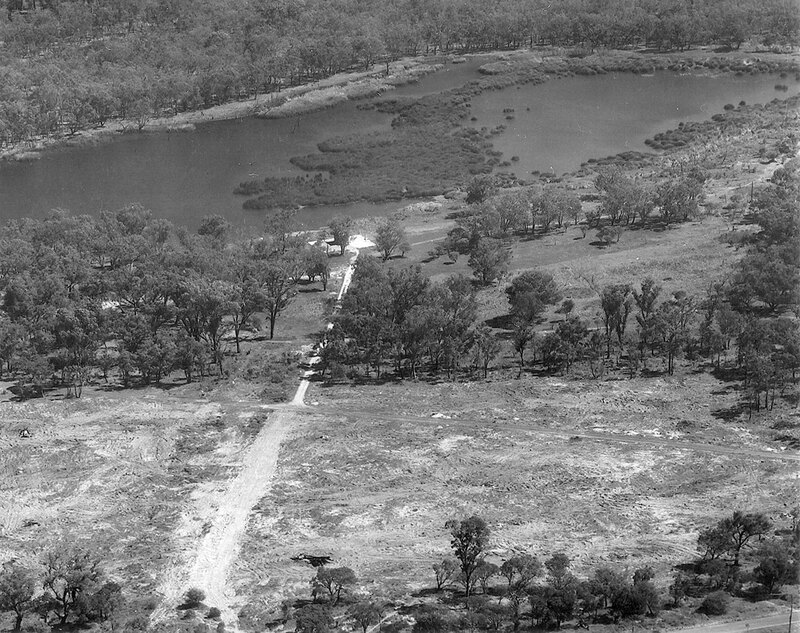 The causeway built for drag line access to the centre of the lake is still visible. West Lake (distance) remains untouched. Entitled ‘Twixt Coast and City’ (oil on canvas 29.2 x 39.6 cm) painted by Walter Frederick Ramage in 1913. 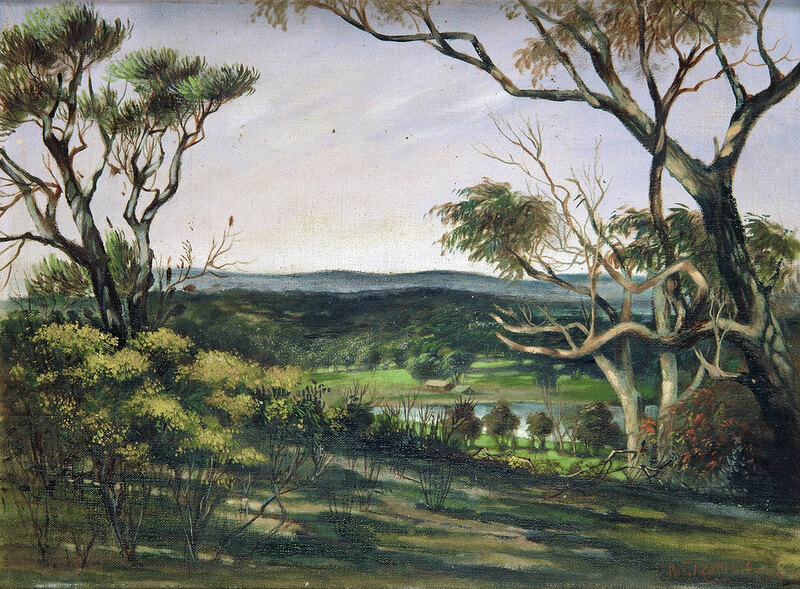 The painting is the view towards Perth and the old Perry family homestead at Perry’s Swamps. 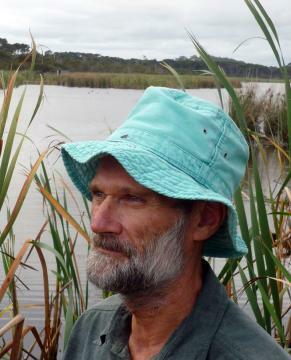 Walter Ramage was a local Fremantle artist. 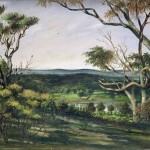 He painted theatre backdrops and landscapes around Perth and the goldfields. He was an art instructor at the Midland Junction Technical School in the late 1930′s. As far as we are aware the painting represents the oldest pictorial documentation of Perry Lakes. Some hydrological information can be inferred from the painting (refer thesis Chapter 2). Ramage’s painting appears as the frontispiece in the thesis. 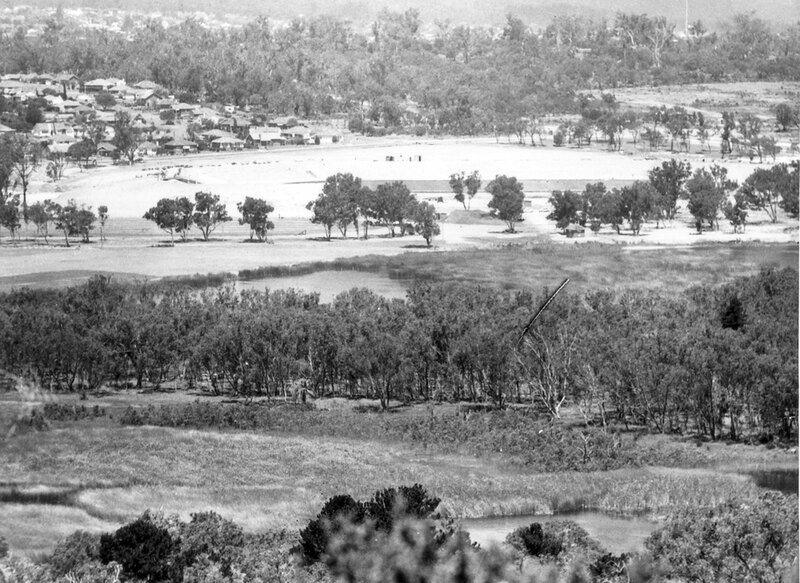 View of Perry Lakes 1921 taken from One-tree (Reabold) Hill. The photo appears to have been taken in winter. Both lakes are almost fully flooded. Dead mature trees around both lakes suggests a recent rise in lake levels (and the unconfined aquifer). Alderbury Flats (left) appear to have been cultivated and are partially flooded. 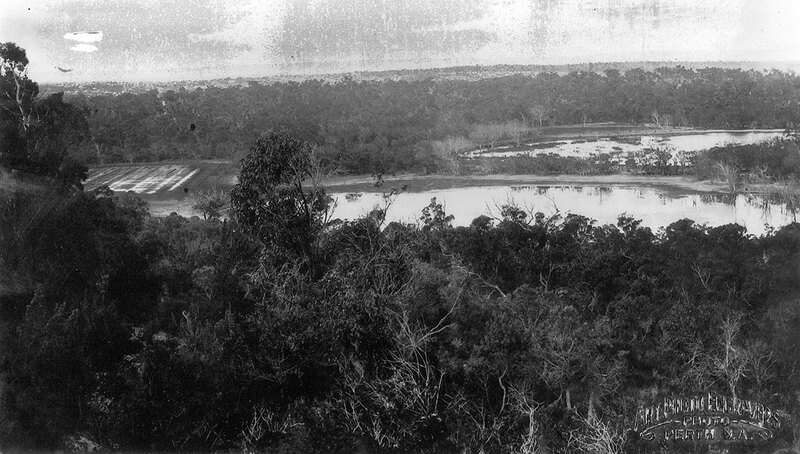 View looking east, West Lake in foreground, East Lake behind. This photo appears in Chapter 2 as Plate 2.2. 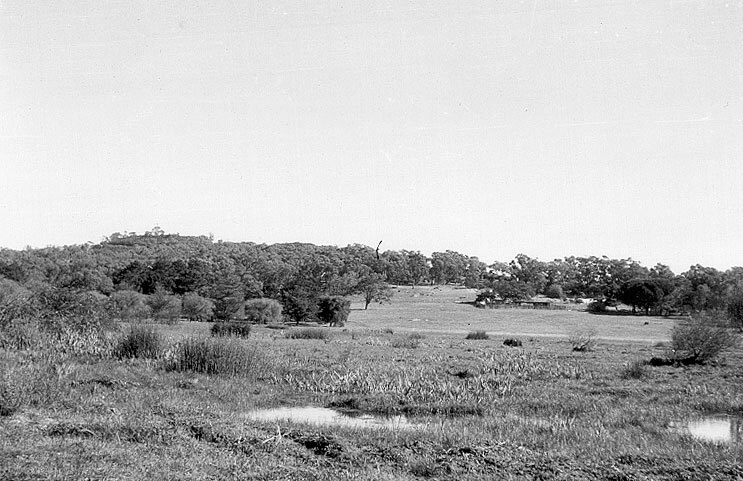 Paddock adjacent to the Ranger’s Residence (‘Perry House’) overlooking West Lake circa 1930. This is when rainfall and lake levels reached their maximum (refer Chapter 2). Many of the large trees on the far shore are flooded. This photo appears in Chapter 2 as Plate 2.3. 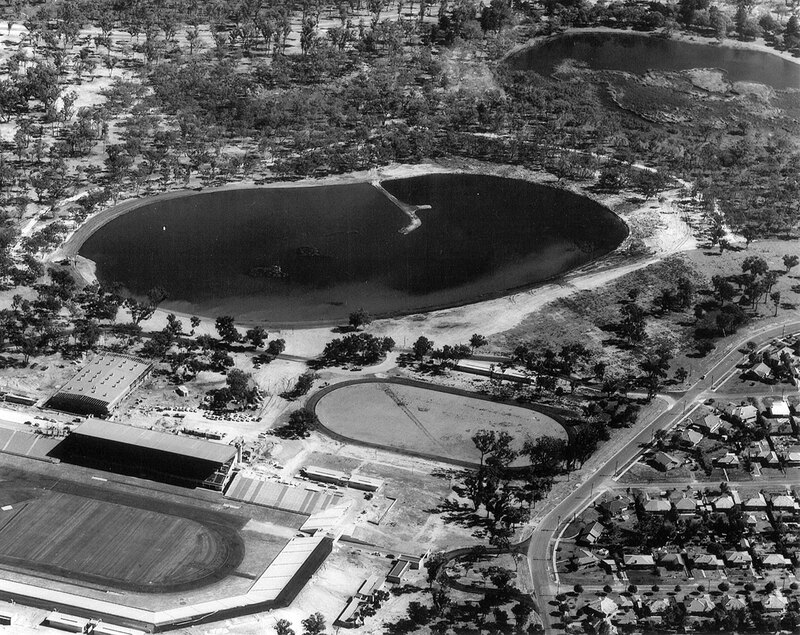 View looking west to East Lake 1961. 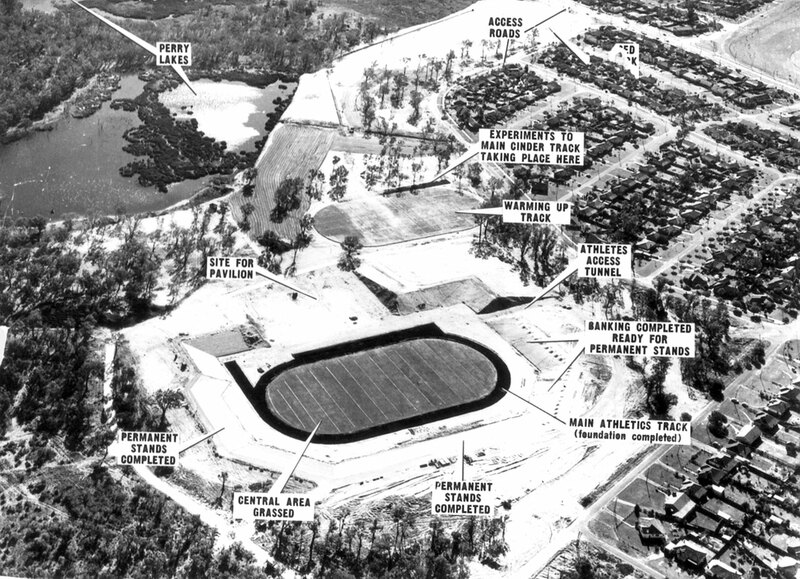 Clearing is site for future stadium. Dead trees killed by rising water levels are clearly visible in the lake. East Lake comprises two sub basins (refer lake lining isopach data, Chapter 3). The two basins are separated by NW-SE trending shallows defined here by Baumea articulata. The sewage pumping station (site of the thesis isotope pan experiments) is being constructed at the end of the white sandy track. This photo appears in Chapter 2 as Plate 2.6. 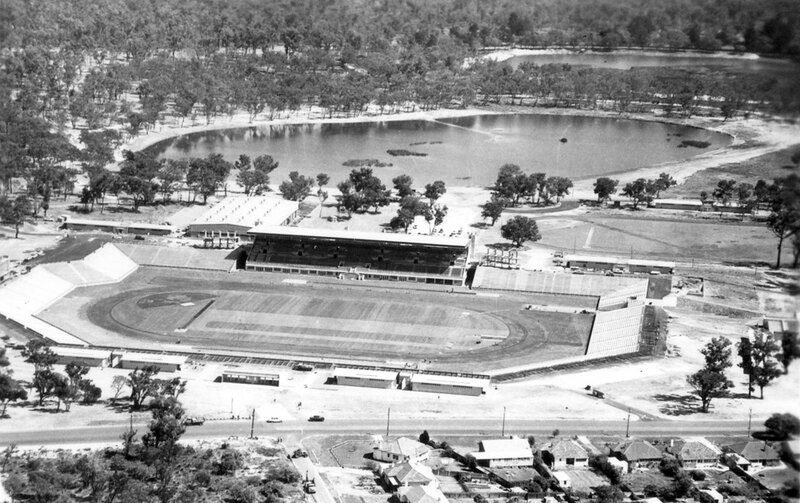 East Lake with stadium and warm up tracks in place. 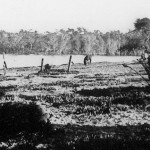 The photo was probably taken in summer as the NE basin in East lake is now dry and the water level in the southern part of the lake is lower. 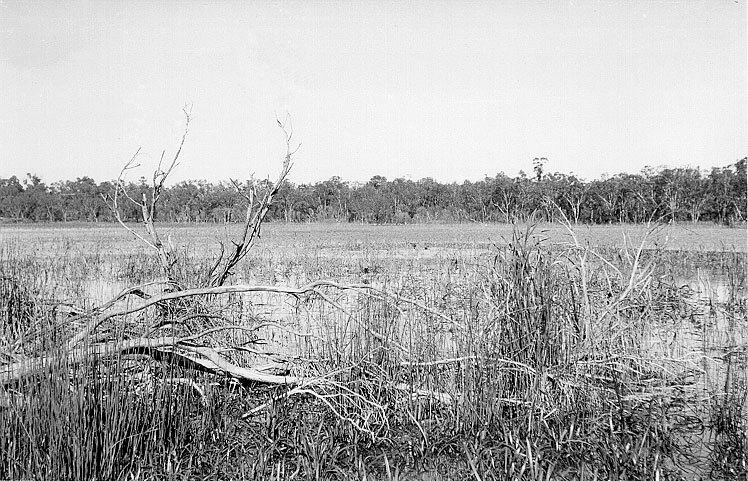 An old fence line is clearly visible (refer Chapter 2, Figure 2.15). This photo appears in Chapter 2 as Plate 2.7. 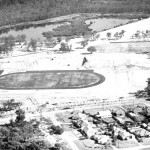 View looking west 1962 across completed stadium. East Lake (mid ground) has been dredged and banks reformed. The flood remediation pumping station (refer Chapter 2) is being constructed at the south end of the lake. There are a few remnant patches of Baumea articulata. The causeway built for drag line access to the centre of the lake is still visible. Wetland vegetation in West Lake remains untouched. Photo appears to have been taken about the same time as Library Board of WA 08. 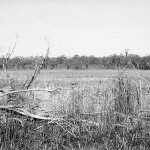 View looking west across East Lake to West Lake where a drag line is removing the original wetland vegetation. The lake edges have already been cut back and reformed. This photo appears in Chapter 2 as Plate 2.8. View across Alderbury Flats towards Perry House., May 1957. 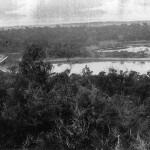 Watson described this area as “an irregular northern flooded area connected on its western extremity by a drainage channel to the Western Lake”. This is the open drain visible in photo ‘Library Board of WA 03′. One-tree (Reabold) Hill visible in distance (see photo ‘Town of Cambridge 01′). 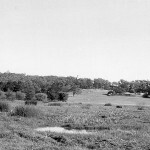 View looking roughly SSW across East Lake, 18 May 1957. Dead trees from 20-30 years of water level rise are evident. This photo appears in Chapter 2 as Plate 2.5.